I had a friend in business school – a Frenchman – who would put together the most fabulous dinner parties with the simplest of ingredients. My roommate and I would watch in awe as he transformed the inexpensive, fresh staple items we’d picked up earlier in the day – a whole chicken, honey, herbs, vegetables – into a sumptuous feast. At this point in my life I was still very much a heat-and-serve kinda gal, with the occasional cookie-baking escapade. I always wished I could learn how to cook by taste like mon ami. 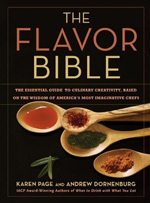 These days, I have a little help in the taste department – have you heard of The Flavor Bible ? I was first introduced to it in a review that Elise at Simply Recipes posted earlier this year. It’s this incredibly comprehensive index of foods and the flavors that best complement them, according to the palates of leading culinarians who were interviewed for the book. Like Elise says, it really is a godsend. Most recently, I consulted The Flavor Bible when I needed a third ingredient to round out today’s panini. I already had horseradish mustard (Foodbuzz sent me some of Emeril’s Kicked Up Horseradish Mustard to try out) and a nice, sharp Vermont white cheddar ready to go. Roast beef was an obvious choice to go with these bold flavors but I already made that sandwich once before. I never would have come up with The Flavor Bible’s suggestion of Golden Delicious apples as a pairing for horseradish, but since I knew that apples go so well with cheddar too I definitely had to give the trio a try. This combination was a winner. 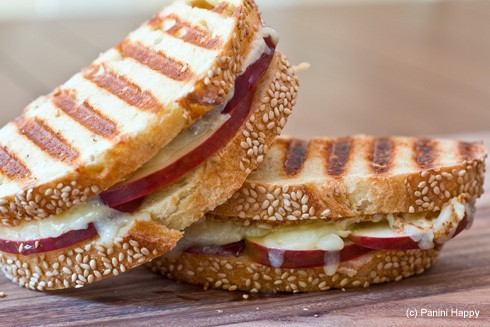 Golden Delicious apples weren’t available, but the Red Delicious ones I substituted offered a gently sweet balance to the bold, tangy flavors in these panini. Emeril’s horseradish mustard was a lot milder than I’d expected, and I surely didn’t skimp (I like my eyes to water with this stuff! ), but I enjoyed it nonetheless with the cheddar and apples. The denseness of the sesame semolina bread I used held up really well to grilling, and the subtle nuttiness of the sesame seeds also paired well with the cheddar. A couple of these made a great lunch and I could also imagine using similar ingredients as an open-faced appetizer – I might try spreading a little mustard on seeded baguette rounds, broiling some cheddar on top and finishing with a fresh apple slice. Preheat the panini grill to medium-high heat 375°. Arrange apple slices in a single layer on one slice of bread. Top with cheese. Spread a generous amount of mustard inside another slice of bread and place (mustard side-down) on top of the cheese. If desired, brush a little melted butter on top for extra crispness. Grill panini for 3-4 minutes until the cheese is melted and golden grill marks appear. Serve immediately and enjoy! .-= sara´s last blog ..Farmer’s Market Pasta =-. What a unique flavor combo! Bet it tastes great! We have a bottle of horseradish mustard! Looks like this would be a good one to try. .-= The Duo Dishes´s last blog ..The Challenge of Working with Yeast =-. .-= maris´s last blog ..Perfect for Date Night: Focaccia with Onion & Rosemary (And a giveaway!) =-. What a fabulous combination! Sounds great, and thank you for the recommendation on the book. 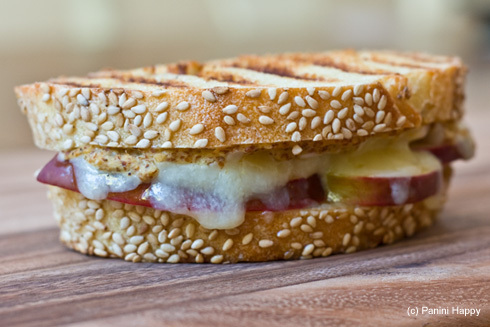 Mmm…this panini is giving me cravings! Love the flavor combo here, definitely going to check out this book. .-= Sandie´s last blog ..A Bountiful Kitchen: Cooking Inn Style with Local, Sustainable Foods (Recipe: Aska Lodge B&B’s Green Tea Blueberry Smoothie) =-. .-= lo´s last blog ..Pâté de Canard en Croûte Part 1: In Creativity We Truss =-. That is an INSPIRING panini, whew. Thanks for sharing and I hope once my mouth stops watering to make one. .-= Patti Londre´s last blog ..Light Tortilla Soup =-. I haven’t seen The Flavor Bible yet, but I am going to go to the library to check it out now. Thanks for the heads up! Okay, I must be living under a fairly large rock because I’ve not heard of this book and it does sound completely amazing. I have heard of apples with cheddar, but not horseradish, and I can imagine the mingling of those flavors. I just may have to add another book to my collection. The panini sounds yummy! .-= kellypea´s last blog ..Bittman Salad 13: Strawberries and Tomatoes =-. Apples and cheese are one of my favorite flavor combos. This sandwich looks amazing, kathy! .-= Susan from Food Blogga´s last blog ..Cantaloupe Boats Are Delicious, Refreshing, and Fat Free =-. Amazing looking panini! Looks like I know what I might have tomorrow for lunch! I’m going to look for that book too! Thanks for sharing it! .-= Kim, Ordinary Recipes Made Gourmet´s last blog ..4 for 4 – 4 recipes in 1 =-. Oh my word! I just stumbled upon your blog and to say it is amazing would be an understatement. Wow! I never knew you could make desserts in a panini maker? Where have I been? Anyway, keep up the great work and all the innovative recipes! .-= Nicole´s last blog ..Give ‘em a Good Scrub! =-. Previous post: GIVEAWAY: Breville, Coach, JetBlue – Oh My!